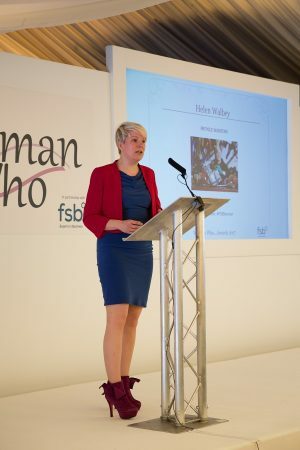 Helen inspired our audience as she shared her business journey, including her personal highs and lows. Helen, is the founder and MD of Recycle Scooters, the FSB Health & Diversity Chair the Chair of the FSB’s national Women in Enterprise Taskforce. I have always worked in typically male dominated industries, and I love being able to promote a positive and successful female image to my work colleagues. Previously I worked in Continuous Improvement in a large multi national building company. Now I own and run Recycle Scooters Ltd and I am the only woman in Wales to own a motorcycle salvage company. Find a gap in the market, develop a niche, never compete solely on price and most importantly believe in yourself. If you have done your research, know your market and product you can find the support and skills you need to make your idea a reality and then make that reality a success. We specialise in providing scooter spares and accessories for modern ‘twist and go’ scooters. We are also a motorcycle and scooter dismantler and trade predominantly via Ebay, from our premises in Aberdare. We export worldwide and also import new accessories and tuning parts for scooters and motorcycles. We also provide a comprehensive servicing and repairs service from our workshop staffed by qualified mechanics. Are you joining us at Twycross Zoo to hear Jenny Hudson from Sweet As? Are you joining us to hear Ruth Waring at Twycross Zoo for the Woman Who…Network?